The #29 Cigar on the 2012 Cigar of the Year Countdown is the My Father Le Bijou 1922 Ecuadorian Connecticut Federal Cigar Edition. 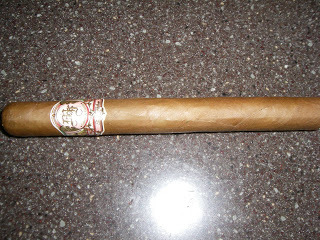 This was a cigar made by My Father Cigars that was made as a retail exclusive cigar for Federal Cigar based in New Hampshire. This marks the fourth consecutive years that My Father Cigars has placed a cigar on the countdown. It also marks the second consecutive year that a My Father Cigar retail exclusive cigar has made the Top 30 (Last year the My Father El Hijo for Smoke Inn placed at #24 on the 2011 countdown). For this cigar, it marks the most radical blend modification to date on My Father Cigars’ Le Bijou 1922 series. This blend replaces the Nicaraguan Habano Oscuro wrapper found on the core Le Bijou 1922 line with an Ecuadorian Connecticut Shade wrapper. The blend was originally designed to commemorate Federal Cigar’s 91st anniversary and was only available in a Cervantes vitola. A few months later, the cigar was added as a regular production retail exclusive to Federal Cigars and the line was extended to three vitolas. The cigars had flavor profile of black pepper, dried fruit, citrus, wood, and cream. Each of the three vitolas brought its own unique characteristics (for example the Petite Robusto had more cream and the Corona had more spice). The flavors are rich for an Ecuadorian Connecticut wrapper cigar as they are medium to full-bodied. This isn’t going to overwhelm you with nicotine and I assessed this blend to mild to medium in strength. The construction of these cigars keeps true to the reputation of cigars made by My Father Cigars. You can click the vitola in the “Vitolas Available” section to see our assessments of each of the vitals.